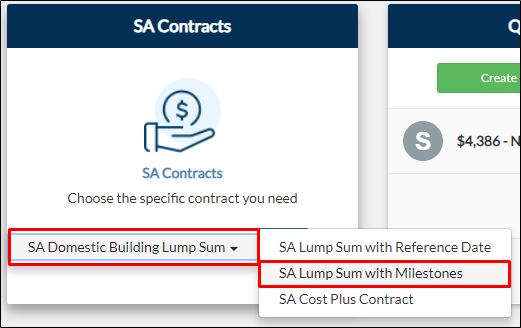 From your project page, go to Pre-Construction > Create > SA Domestic Building Lump Sum > SA Lump Sum with Milestones on SA Contracts tile. 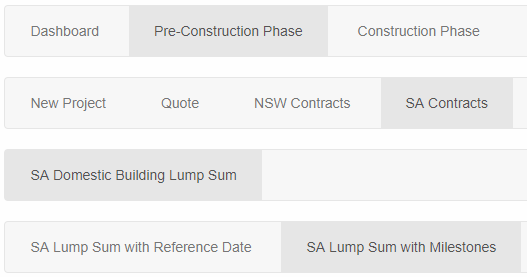 From your navigation bar, go to Pre-Construction > SA Contracts > SA Domestic Building Lump Sum > SA Lump Sum with Milestone. Or type in ' SA Lump Sum with Milestones' on the search bar located on the upper right corner of your portal. 2. You will be directed to the SA Lump Sum with Milestone page. 4. For the Breakdown of the Estimated Cost Price, you can fill it out using the Copy from Quote or Copy from Quote Journey button. Data will be coming from the latest quotation created in your project.